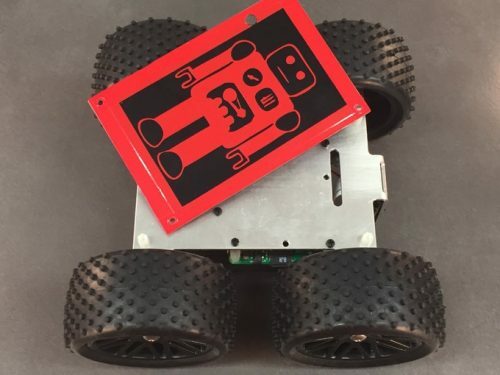 Formula Pi is the latest Kickstarter project to come from PiBorg, the team responsible for the ZeroBorg motor controller, the wonderful DiddyBorg robot, plus a bunch of other wonderful Pi creations. We’re big fans. Allowing backers from across the globe to participate, the Formula Pi project consists of two race events. Competing in either the Summer or Winter Series (or in both if they want), participants modify code to run the autonomous Pi Zero-powered cars around 23 laps of the course. The team at PiBorg have done the majority of hard work, building the cars and writing the basic code. Entrants then have the chance to add to the code before it’s inserted into their car via SD card, to give their robots an edge – and the race begins. Claire, Tim and the PiBorg team aim to continue the Formula Pi experience, expanding on the races to allow for different classes, speeds, and coding challenges. They also plan to include a battle series in which a MeArm is attached to their YetiBorg, creating the ultimate fighting ArmyBorg. Both Summer and Winter Series races will be broadcast live for everybody to watch. (We’ll be covering them here.) If you want to take a active part, entry will cost £35, which includes a customisable ‘lid’ for your car, giving you the chance to make your racer stand out from the competition. Code will be made available to all racers once the Kickstarter campaign ends on August 22nd, allowing time for modifications before race day. 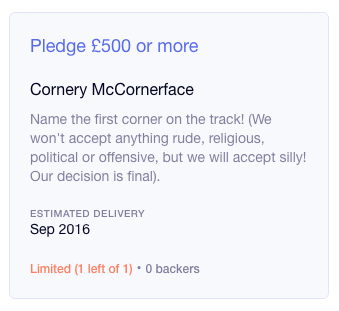 Rewards for backing the Formula Pi campaign include having your logo placed upon the track, owning your own YetiBorg racing robot, and the chance to name the first corner of the track. For more information on the PiBorg Formula Pi campaign, plus a few chuckles at the outtakes of making a car ‘driverless’, check their Kickstarter page out now. Now. Now, now, now, now, now! i.e. 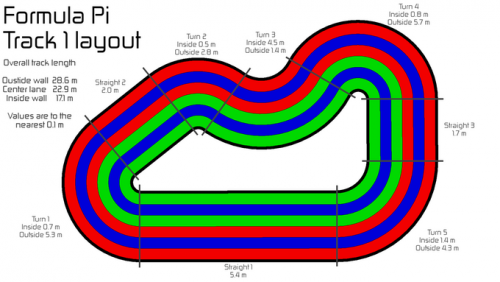 23 laps of 22.9m (centre lane) = 526.7 m which is approximately 1/2 km. Sounds like Tom identified a misstatement then. Laps are definitely not 1/2 km in length as the photo caption states. Looks like you’re right – I’ve removed the offending caption. Ah, I’ve just spotted the bit you quoted. I guess Alex meant to say “The races are approximately 1/2 km in length”. when will the live stream be. I just want to make the car. In Ukraine, came up with a similar competition for autonomous mobile robots – RoboRaсe https://www.youtube.com/watch?v=EbUDHBE_GqI . Now our team is also doing experiments on the development of mobile robots based on Raspberry Pi control system and MATLAB & Simulink https://www.youtube.com/watch?v=42we9W22iCM . Soon we will demonstrate autonomous robots for RoboRace based on Raspberry Pi Camera Board. I wonder if the basic code will be available for those not participating in the competition. Any suggestion? Nice Blog! Thank you so much for sharing. I really appreciate to blogger for wonderful sharing. PiBorg are an organisation making add-on boards for your Raspberry Pi.